There will be more photos to follow – keep checking for latest additions. The journey started in earnest from Cap Day. We shall now refer to time as BCD (Before Cap Day), and ACD (After Cap Day). Once the team caps were handed out then, “team stuff” commenced. Firstly there was the pressure of team selection, no mean feat for the selection committee I am sure. There were ferries to book, stables to coordinate, holiday from work to arrange, and the small matter of some competition against talented people from all over Europe. We hoped that somebody, somewhere, had an idea of how this show was going to work (and that Lucy our super hero Team Manager would find them), oh yeah and somebody mentioned jodhpurs! Jerry Naish and Nosey (Chex Out This Slide). Poor Lucy had her work cut out. Lucy is actually a super hero, just with her pants on the inside. She did all the hard work to get the details of the show, and then managed the logistics to get us (think herding cats), to attend a clinic, and then to go to France. Lucy also introduced us to another incredible lady, Charlene Carter. I could hear her words “don’t melt like an ice cream”, “side pass like there is a rattlesnake in front of you”- thanks Charlene; we had a plus half side pass in our ranch riding class. We had a few surprises on the clinic day as Charlene and Lucy worked out which horse rider combinations should take on each class. The team had two excellent showmanship contenders in Evelyn and Jane, but it was a bit of a shock to me when I was asked to take Nosey in too. With Charlene’s guidance I was able to get nice pivots without her picking up her pivot foot. This doesn’t seem like much, but with a five to ten point penalty for each time this happens in a class, it’s a big deal. Small tips like this helped keep us out of the penalties, and with some pointers on how each combination looked the best in terms of frame and pace for each class, we were off. A few days later, somewhere in a dark and rainy yard in Kent, we all met up again. This time we were going! Sally and I had found the place, a good start, given the fact that the lane is cleverly disguised as somewhere you would never think you should take a lorry. A few hundred metres sprinting though puddles in the dark revealed that, in fact it was. Most of the rest of the gang had arrived; Gill and Evelyn were still on site and made us very welcome, showing us where things were and helping us get organised. The horses settled immediately, and we were asked to leave our passports outside of our stables for the vet check in the morning. Having seen Gill’s passport blown into a puddle I was very careful to place mine safely. Walking into our area of the barn in the morning the only sign of stress I saw from any of the team horses was them trying to work out if it was their breakfast I was carrying! I was cheerful…until I saw a vet holding Nosey’s passport. The passport was not spilled a drink on it wet, not even, dropped it in a water bucket wet. It was tissues in the washing machine wet! A small river had appeared in the night and chewed up Nose’s passport, leaving behind translucent scraps of paper mush. Very luckily the vet was nice, and amid the running ink and quickly dissolving paper she was able to work out that Nosey did match her description and was up to date on her jabs – phew! The whole group got together to set up everyone’s sat navs and Evelyn was issued with Fran Nav, that is Fran navigating. Everyone but Gill had a co- driver, so we sandwiched Gill in the middle of the convoy and headed for France. With our illustrious leader blazing the trail, we made it across almost without incident. A few of us followed a re-routed sat nav around an accident, and saved about a minute in total. The tour of a small French town was not really a highlight, but we made it none the less. On arriving at Le Pin we met Alison and Bob who helped us to set up camp and get the horses settled in. After a long journey everyone was tired and Michael and Fran made dinner for the whole group and then we headed to bed. Fran, Michael and his barbeque cannot be commended enough for their services to team UK throughout the show! On the Thursday we had a day of practice. Practice involved putting gummy bears on my hands, (to train me to hold my hands still in the showmanship), Britishification of our stables and lots and lots of pattern learning. Alison had brought loads of big flags and giant bunting, Sally brought balloons, and the famous Debbie qhs supported us from home, having sent some wonderful stable signs with our details on them (and lending us some beautiful outfits), Between us all we made the stables look fab, and had a lot of fun too. The Friday was a big day for the team, first day of competition and a chance to test out all the hard work. Mary and Lucy were arena-side all day. I’ve never been to a show with this level of support. Lucy and Mary were there to help as much or as little as you wanted. It was great to know you had back up with pointers, pattern panic and anything else you needed at any time – and water, lots and lots of water as it was hot. 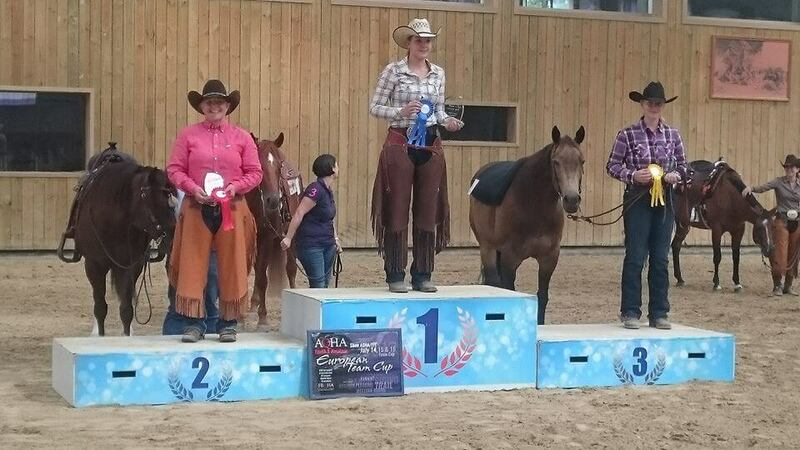 Friday yielded some great results, with ten podium finishes for team AQHA UK members. There were also loads of personal best scores across the board, so the show prep we had put in really was paying off. I have never been so excited watching some of the disciplines that I know less about. Even the support we received though the Facebook group was astonishing. Over 250 people were following us in just a few days, the good wishes and kind messages really boosted everyone when we were reading though them together in the evening. Most of all, knowing how much one another had put into the training, really made watching every single member of the team so very exciting! The logistical challenge of picking and entering Saturday’s team was very apparent on Friday. The team of five riders (Debbie, Gill, Jane, Evelyn and myself), who had to be named in advance, were required to compete in a minimum of three classes each from, Showmanship, Horsemanship, Pleasure, Ranch Riding, Trail, Western Riding, Reining, Hunter Under Saddle and Hunt Seat Equitation, while individuals (Sally and Alison) could compete in whatever they wished. Each event gave the option for three team members as well as individual competitors in each class (with the exception of western riding and reining, which only required two). That makes for 25 entries, so if split evenly that made five classes per horse. A horse that can successfully compete in five disciplines is quite an all-around horse by anyone’s standards! Even in the classes that were more of a stretch for me, I just kept in mind the fact that there was one point for going into the class and staying on pattern. No matter how daunting other competitors seemed, in every team there was also someone, like you, who was competing out of their comfort zone…there aren’t many people and horses who regularly compete at top level in five or more events, so it was important to keep this in perspective. Throughout Saturday our team put in some really strong performances and at the end of the day, after lots of solid results in huge classes, we finally had a podium finish! Alison pulled it out of the bag, and second place in the Ranch Riding. 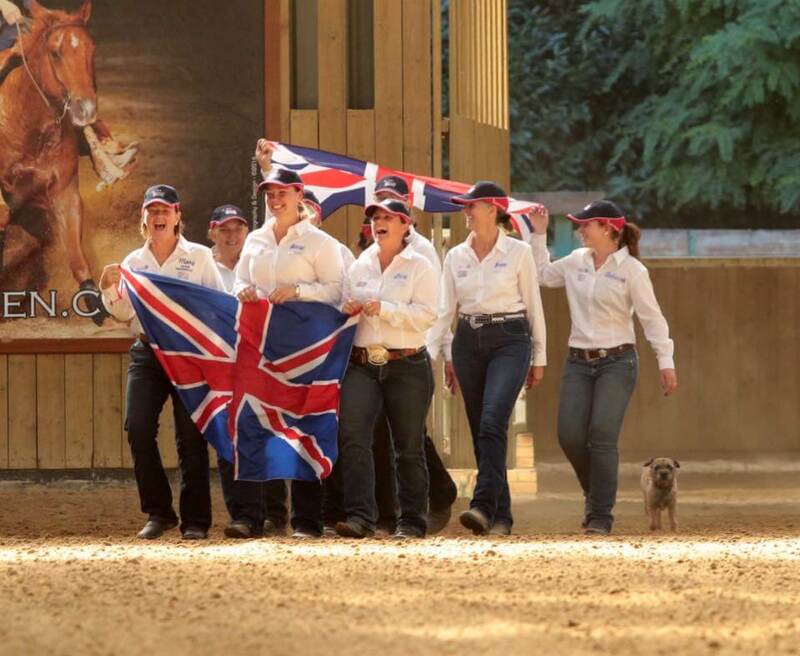 I’m pretty sure team UK cheered the loudest as we were so proud of Alison and Jac for their fantastic result. We had a few podium near misses too, so we had a great day, though it was hard not to notice the German, Swiss and Italian national anthems playing a lot. In the evening the whole crew got together under the silver birch trees and feasted on a Tex-Mex cook out that the show had laid on. Some people danced and chatted all night, while others went to bed. I did hear a rumour that one of the team campers stuffed wet wipes into their ears and donned a hoodie in a bid to drown out the disco, and the shouty horse next door…but that would be another story. Sunday began and we were ready, we had high hopes, and our team had their strongest events to come. Some of us started the day with an early morning reining warm up session, followed swiftly by great coffee and croissants from the onsite café, while watching Gill and Greg flying the flag for us. They did it, and made the podium earning an excellent third place in the trail… all before I’d finished my breakfast! We were all holding our breath in the prize giving, but I don’t think anyone had any left once we had finished cheering, a great result in the bag for the team. After lunch came the reining, we had looked at the overall team score and considered our tactics. We decided all we could do was to go for broke…so we did! In possibly the most exciting class of my life, I was first in. Nosey did me proud and gave some of the best manoeuvres of her life (so far). Unfortunately we had a small but expensive wobble on our first set of circles, so I had too much ground to make up to get the result I would have liked. I was absolutely delighted to see that keeping showing had resulted in a few pluses and an otherwise credible run. I feel so much more confident in my fantastic horse now, knowing that she is now ready to really compete, and next time I am sure we will have the little extra seasoning to swing the results our way. The other ladies in the team totally smashed it, and both Alison and Debbie made it to the podium with truly outstanding scores and Sally had a great run too. It was an absolute joy to compete with such talented people, and it was so exciting to see two Brits on the podium again. The fantastic pit crew came into their own to help me change from reining in to hunter mode. Fabulous Fran did plaiting while marvellous Mary switched tack, aided by anyone else who had a spare hand. 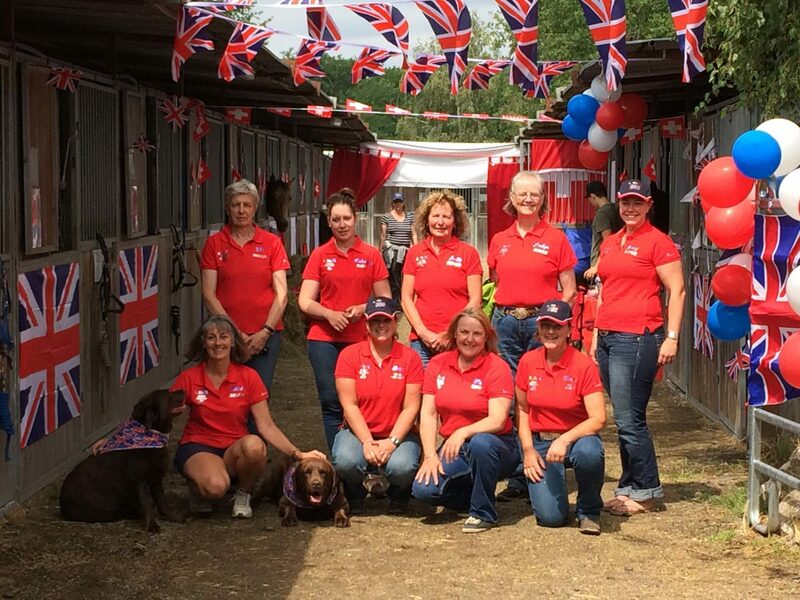 I was greatly indebted to them as it was 30 degrees and the speed change into the English clothing was not my favourite experience, but I felt better knowing that my horse was well walked off, watered and rested before we had to go again in the next class. I genuinely could not have achieved that without the support of the team. Evelyn, Jane and I battled it out in a Hunter class reminiscent of the M25 on a Friday night in summer, while Mary and Lucy guided the less experienced (me) around from the rail. In the UK I have never had to compete for space on the rail like that, and the support of the dynamic duo enabled me to take 12th place. Although I would have liked to achieve more (as of course we always strive to be our best selves) I really don’t think that Nosey and I could have done any more. She was absolutely the best she had ever been, and huge thanks must go to Charlene, Lucy, Mary, Sara and everyone else who has helped me learn this new style. We finished the competition with “The Minion” a Hunt Seat Equitation pattern named by our followers at home because of its rather intricate shape. It was by far the most testing Eq. pattern I had ever seen, and we all gave it a great shot. Overall our team came 5th, which is a good result for our first year, most importantly we beat the French, though the German, Swiss, Italian 1,2,3 had seemed set for some time. In the final closing ceremony, (where Lucy gave her second excellent ad-libbed speech of the week, we’ll know what’s expected next time) the talk of next time began. 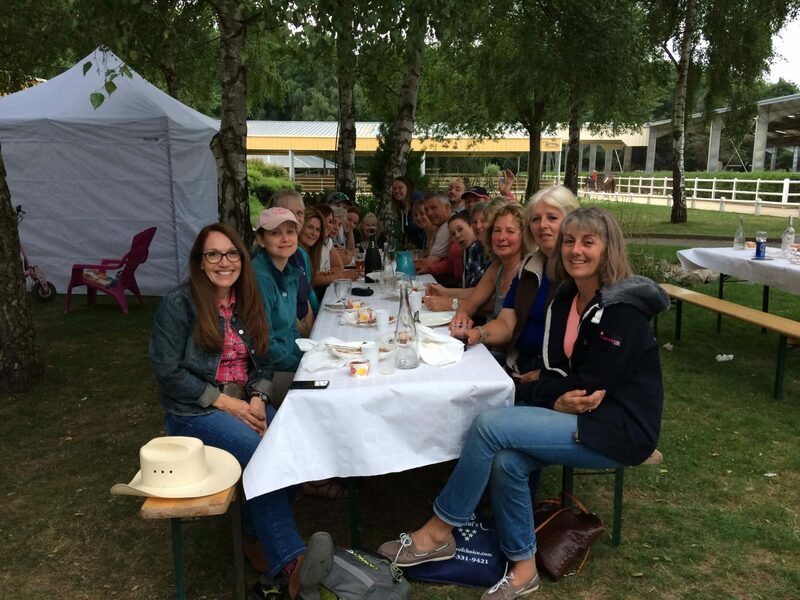 The competition is every other year, so we have plenty of time for everyone to have a rest, and to train some more, then let’s hope we can send another team AQHA UK. The Euro Cup was a fantastic experience that I will never forget, and I owe thanks to so many people that I cannot even list you all, (or this article will never finish). Let’s just suffice to say that you can’t practice for this experience. Most riders work a lot on their own, yet the closeness and support that I felt from the team was astonishing. I really enjoyed getting to know some people that I had known for a long time, but not truly known (thank you for your words Gill), and there were some people I hardly knew who I am pleased to know now. Every single person was a superstar and faced their own personal, physical and logistical challenges to get there, something I hadn’t really appreciated before I signed up. Most of all I am in awe of the incredible horses that we all have. 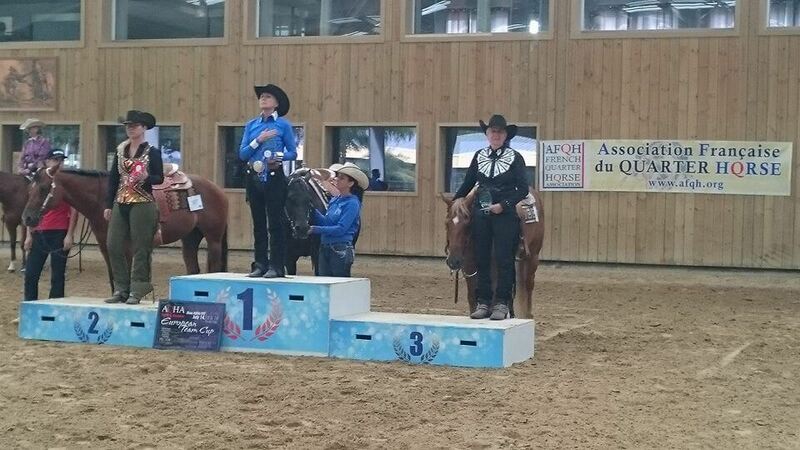 Every horse we had with us was credit to the American Quarter Horse breed, taking on a number of different classes, a new environment, and lots of travelling and every single one gave a great performance. 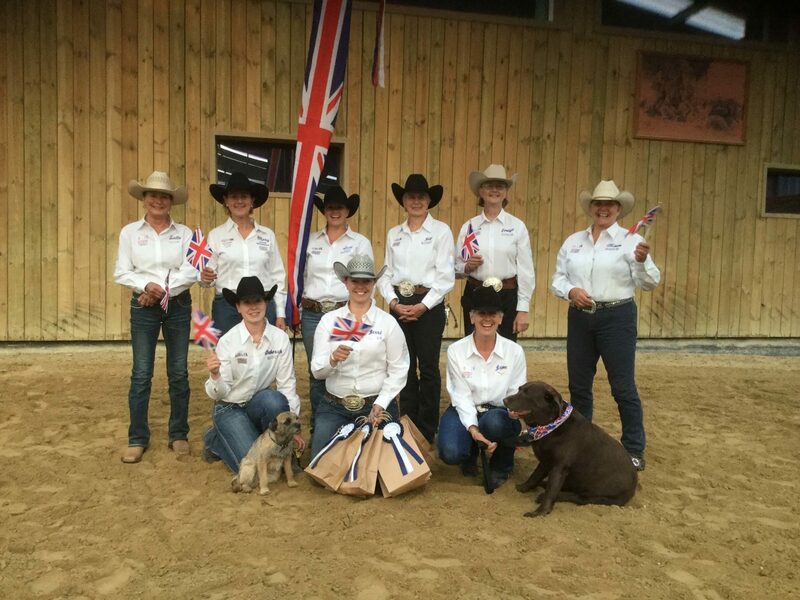 AQHA UK have started something wonderful in sending this team of amateurs out into Europe, and I do hope it can continue. The calibre, and quality of horses that are being bred, trained and maintained on this little island are truly something we can all be proud of, and the people that come with them are pretty awesome too!